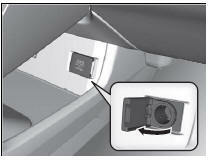 The accessory power socket can be used when the ignition switch is in ACCESSORY or ON *1. Do not insert an automotive type cigarette lighter element: The power socket can overheat. The accessory power socket is designed to supply power for 12 volt DC accessories that are rated 180 watts (15 amps) or less. To prevent battery drain, use the power socket only when the engine is running.